NEW figures suggest at least 1 in 10 North East children are still being exposed to toxic secondhand smoke in the home as a hard hitting new campaign for our client Fresh, supported by the British Lung Foundation, launches today. 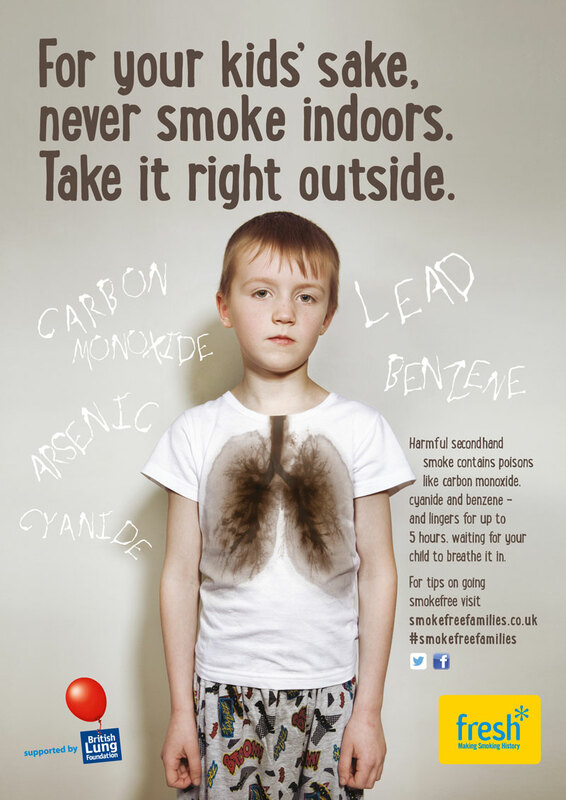 The “Secondhand smoke is Poison” campaign is warning that smoking in the home exposes not just smokers but children and adults to harmful levels of toxic chemicals such as carbon monoxide, benzene and cyanide which creep from room to room and can linger for up to five hours. The campaign was first launched by the Scottish Government in 2014. 85% of secondhand smoke is invisible and odourless but many people are not aware that steps like opening a window, smoking by the back door or smoking in another room does little to protect children and other non-smoking adults. Ailsa Rutter, Director of Fresh, said: “When someone lights a cigarette they are setting fire to a cocktail of chemicals and industrial pollutants. These not only go into the lungs and around the body, but into the air as secondhand smoke. “Ev ery parent wants to protect their children. However, many smokers think they’re already doing enough by opening a window or smoking the back door, without realising how poisonous secondhand smoke spreads around the house and lingers, long after you can see it or smell it. 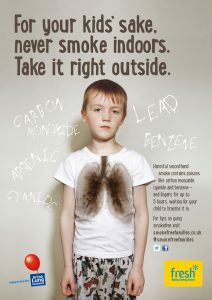 The campaign website http://www.smokefreefamilies.co.uk/ gives people the facts, helping them understand how smoking indoors pollutes the air their family breathes, and how they can take simple steps to make their home and car smoke free. This is the second time Fresh has teamed up with the British Lung Foundation to launch a major campaign aimed at raising awareness of the risks of tobacco smoke, following the “Every Breath” campaign which first launched in 2011. The BLF campaigned for the law preventing smoking in cars with children which was introduced in 2015 and is now supported by 91% of North East adults.